Reflections and Ruminations: Why God invites us to make a sacrifice of praise. Heb. 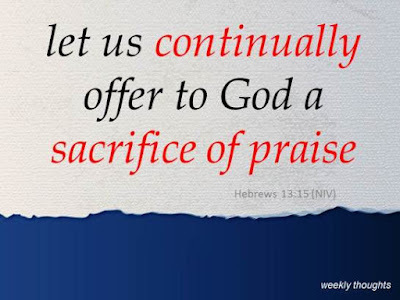 13:15 tells us that we ought to offer God an unending sacrifice of praise. How do we understand this phrase “sacrifice of praise”? How can praise be a sacrifice? It seems to be a contradiction of terms, but in truth, it really isn’t. When do most of us give God praise and thanks? Most likely, it is when things are going well for us. When we get that raise or promotion that we had been eying all this while, or when thing are going swimmingly our way in life, or when the doctors give us the report that there are no parts in our bodies that appear to be wearing down or riddled with tumors. In other words, when life is good, when there are no afflictions and tribulations, directing our gratitude and praise to God is, as they say, a no-brainer – at least for those of us with faith. There’s really not much merit in doing this, because it is something that we really should be doing. While it is good to know that we should be giving thanks to God for all that we have but do not deserve in life, in themselves, these do not constitute a ‘sacrifice’ per se. There is not much of a ‘dying’ that happens to cause this gratitude to emote from our hearts. For a sacrifice to be sacrificial, something has to be offered up, put aside, entailing some kind of death. How is this applicable to us? I have said it in many past reflections in this blog that ultimately, our lives are not about us. If we understand this to be so, then praise given to God should also not be about us. If it is only when our lives are good and when our lot in life has abundance and isn’t filled with challenges that we give God praise, aren’t we also making praise about us? But if our lives are riddled with crosses big and small, when we are faced with challenges and trials galore and have worries and anxieties aplenty, and despite these, we come to God and praise him still, then our praise would have a ‘sacrificial’ element in it. Mindfully wanting to cast aside our pains and problems that may be rife in our lives and willfully praise God with a selfless purpose will always be a sacrifice simply because it takes effort. It entails some form of a dying in us, and it reminds us that our lives are truly not about us, and neither is our praise of God contingent and predicated on his blessing our lives with goodness. Maybe that report from the doctor came back with a positive result, revealing a cancer that requires treatment. It could be that you lost your job due to a downturn of the economy. It may well be that you have just lost your spouse or best friend after a long battle with a debilitating illness that he or she finally succumbed to, leaving you without a spouse or a parent to your children. Making that effort to still give God praise while experiencing these very real agonies in our lives adds a tremendous value to the quality of praise that we are sending to God. It may well feel like a death that you are going through at that time. But to lay them aside and thank God for his sake, and not for ours, raises the quality of our faith to another level altogether. Part of the reason may well be that we are just so conditional in our love – for others and for God. If we find ourselves only being grateful to others and thanking them for being in our lives when they do extra special things for us, or being forgiving to them only when we see strong evidence of their repentance and change, and not because forgiveness comes from our hearts and because we love them, our love for them is actually conditional and fear based. We may also extend this conditionality onto our relationship with God. We may believe (erroneously of course) that he deserves thanks and praise only if he is extra ‘godly’ in giving us more than what he should already be giving us in life. In encouraging us to give God a ‘sacrifice of praise’, the writer to the Hebrews is actually asking us to imitate God in his unconditional love for us. He is beckoning us to live with enlarged and expansive hearts. God sent us His son to save us not because we deserved salvation or as a reward for being good. In fact, it was just the contrary. God gave us salvation despite our not deserving it, and is not predicated on any sense of quid pro quo or some zero-sum game. The author of Hebrews had a deep sense of this, and is encouraging us to love as God loves, and be as unconditional as he is unconditional. 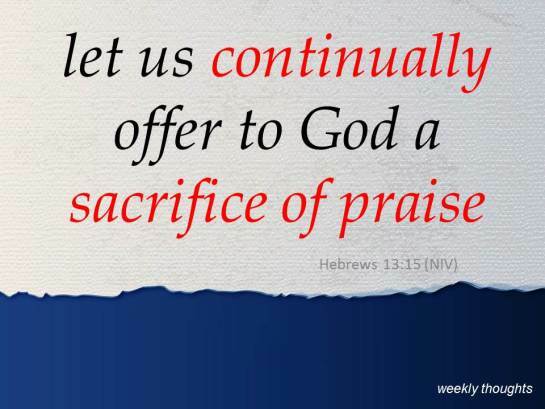 I believe that all of us have the ability to offer beautiful sacrifices of praise to God that He alone deserves. Truth be told, I’m afraid that if we are honest about it, it may reveal that even in our praise of God, we could in actual fact be conditional, calculative and parsimonious. How do we understand this phrase “sacrifice of praise”? Some time back, we were told that there would be some “changes” in the wordings or expressions in the liturgical celebration of the mass and of course to help us, our parish did try to introduce more current materials on the Eucharist and the celebration of the Eucharist. We were also encouraged to attend talks on this. It was in one of these sessions that I first learnt that the Eucharist is termed as a “sacrifice of praise”. I like the sound of it and thought it was so apt, for in my simple mind – mass is always about sacrifice at Calvary and the reason for it was because of God’s pure love for us. So I felt that if I could really immerse myself in this form of worship and enjoy the whole process – from the words in the readings to all the poetic Psalms and hymns – it would actually be an offering of praise for I would not have any ulterior motives or intentions to “make God answer my prayers or requests”. It would be like praising and thanking God because He is God. The only thing that didn’t fit - in this simplistic picture is the ‘sacrifice’ part......because I believe that for something to be a sacrifice, it needs a ‘doing’ – not merely mouthing words of praise and thanksgiving.....but here at mass it is the Lord again who does and is the sacrifice! ( I don’t know if this makes sense) So where is my sacrifice? Anyway, reading your post makes me reflect that if sacrifice “....... entails some form of a dying in us” – then perhaps, at the beginning of mass, if I were to bring to that present moment, the big and small ‘dying to self’ moments of my very ordinary daily life, it may help to make this particular mass a truly more “sacrifice of praise” ?